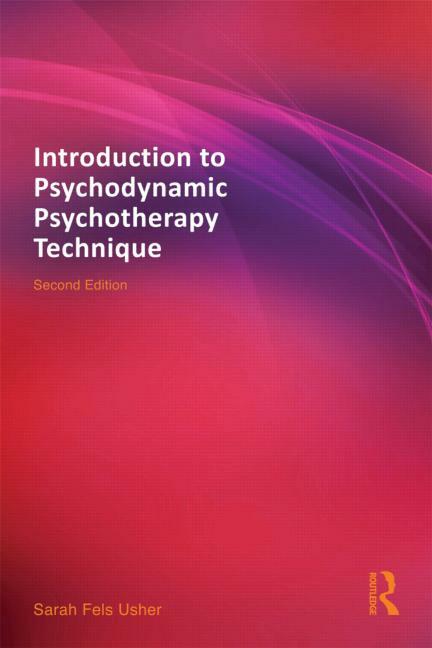 Introduction to Psychodynamic Psychotherapy Technique is a revised edition of the popular technical guide to the conduct of psychodynamic psychotherapy written by Sarah Fels Usher, published in 1993. In her thoroughly updated book, the author takes the student from the very beginning through to the end of the processes involved in using psychodynamic psychotherapy as a method of understanding and treating patients. Introduction to Psychodynamic Psychotherapy Technique offers explanations of how psychoanalytic/psychodynamic theory underwrites the technique, and demonstrates how the technique follows from the theory in a clear and accessible style. Each chapter is organized around the psychoanalytic concepts of transference and counter-transference, demonstrating how these concepts bring the work together. New material includes a chapter devoted to working with patients’ defenses, an in-depth look at the emotions on both sides during termination, and a chapter on the experience of supervision, all accompanied by lively clinical examples. The book is unique in that it is written from the point of view of the student, highlighting the difficulties they may encounter in practice and offering concrete suggestions for technique. Introduction to Psychodynamic Psychotherapy Technique will be of interest to psychoanalysts, psychotherapists, psychiatric residents, graduate psychotherapy students and social work students. "Students of psychotherapy-- psychologists, social workers, and psychiatrists--are usually exposed to didactic courses. Rarely, however, are they given such systematic and detailed information regarding the ins and outs of doing psychotherapy as in this well-written book, of which this is the second, revised edition. This book meets a vital need for teachers, supervisors, and students involved in any way with dynamic therapy." - Morris Eagle, Professor Emeritus, Derner Institute of Advances Psychological Studies, Adelphi University, USA. "This is a highly readable book concerning all introductory aspects of psychodynamic psychotherapy. The inclusive, but highly personal, tone leads the reader to rethink many of the issues other texts take for granted. This is a must- read for all psychotherapists and a welcome addition for any psychotherapy programme’s suggested reading list." - Douglas H. Frayn, Clarke Institute, Canada. Preface. Understanding the Language of Psychodynamic Psychotherapy. Starting Out. History Taking and Formulation. Selecting Appropriate Patients. The Ongoing Therapy. Stick-Handling Defensive Patients. Ending. Using Supervision. Sarah Fels Usher is a psychoanalyst and psychologist in private practice in Toronto. She is on the faculty of the Toronto Institute of Psychoanalysis, book editor of the Canadian Journal of Psychoanalysis/ Revue Canadienne de psychanalyse, and past president of the Toronto Psychoanalytic Society. She is also the author of What is This Thing Called Love? : A Guide to Psychoanalytic Psychotherapy with Couples , (Routledge, 2008).